A lot of our Muslim brothers and sisters are not aware that the Raafida (Shee’a) hate the Sahabah (companions) of our beloved Prophet صلى الله عليه وسلم. They even declare them kuffar except for a few of them. 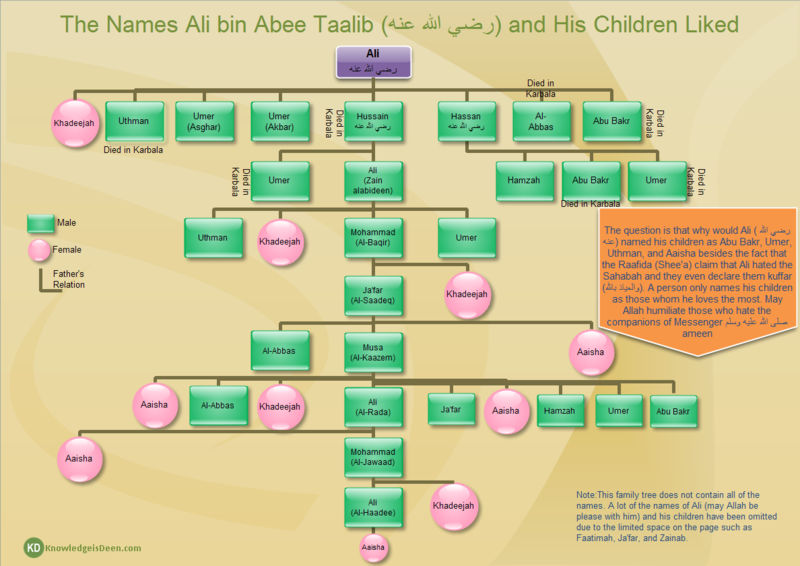 Please take a look at the image below and see that Ali (رضي الله عنه) and his Children named their sons and daughters on the names of the Sahabah for the next eight (8) generations. You will see the Abu Bakr, Umer, Uthman, Aaisha consistently for the next eight generations. It is a strong refutation for those who curse and hate the Sahabah (رضي الله عنهم). My only question is that why would a person name his children on the names of those he hates the most. It is a clear evidence that the religion of Raafidah is based on lies, slander, and deception. May Allah protect us from their fitnah, ameen.